Normally CSF is low signal intensity on T1 and high signal intensity on T2 sequences. However, the normal CSF signal is frequently altered on T2w sequence by normal dynamic movement of Csf and that can confound interpretation. 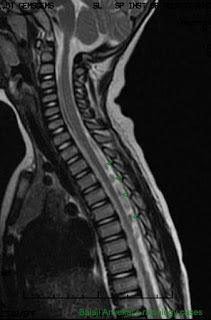 In spine frequently encountered in dorsal region dorsal to cord, when subdural space is roomy due to wide spinal canal or cord atrophy, not to be mistaken for T2 flow voids of a high flow vascular malformation and in brain in lateral ventricle near foramen monro or third ventricle in cases of roomy ventricular system due to hydrocephalus, not to be mistaken for intra ventricular lesion. CSF Physiology and Flow Dynamics: Total amount of csf in brain and spinal cord is ~140 mL, on that there is ~ 500 mL per day production of CSF, with a net CSF flow from the lateral into third ventricles, through the cerebral aqueduct in fourth ventricle and into the CSF spaces around brain and cord. The varied flow velocities and directions result in more rapid dephasing and signal loss termed “intravoxel dephasing.” A commonly encountered CSF flow artifact is the signal void in the dorsal subarachnoid space on sagittal T2-weighted images of the thoracic spine. This artifact is due to a combination of the respiratory and cardiac related pulsatile CSF flow superimposed on cranially directed bulk CSF flow and turbulent flow from CSF moving from the ventral subarachnoid space to the dorsal subarachnoid space. This complex CSF motion results in phase incoherence leading to signal loss on T2. In brain turbulent flow is often seen in the aqueduct of Sylvius, the fourth ventricle and is sometimes seen from transmitted motion from arteries. Turbulence dephasing can be reduced by shorter TE sequences and smaller voxel volume, decreased slice thickness or higher matrix. 2. Time-of-flight (TOF) effect: TOF effect further divided into (i) TOF loss resulting in dark CSF signal and (ii) flow-related enhancement (FRE) producing bright CSF signal. TOF Loss: Signal formation in MRI depends on mobile protons experiencing the initial radiofrequency pulse and the subsequent refocusing mechanism. TOF loss typically occurs in spin-echo or fast spin-echo imaging when protons do not experience both the initial radiofrequency pulse and the subsequent radiofrequency refocusing pulse. Finally, gradient-recalled echo (GRE) techniques are resistant to TOF loss because of the short TE. Flow-related enhancement (FRE) or “entry-slice phenomenon” results in bright signal from unsaturated protons flowing into a slice replacing outflowing partially saturated protons during the TR. The unsaturated protons have their full longitudinal magnetization, which is flipped into the transverse plane by the initial radiofrequency pulse producing a higher signal than would be expected if they were stationary, partially saturated protons. Scanned sequentially, the first slices of the imaging volume into which the unsaturated protons flow show this effect most prominently, hence the term entry-slice phenomenon.